Increasingly countries must now resort to long term and official policies to try and increase their fertility rates. In Japan government policy is all about providing incentives for couples to have more children. In Iran government policy is moving from exhortation to “go forth and multiply” to now the banning of vasectomies and discouraging contraception and abortion. Of course the Iranian measures are drawing much criticism from groups which believe that this is making women into baby-factories! European countries have been addressing this by their immigration policies even if they rarely admit that declining fertility is a problem. I note that addressing the ageing problem is politically acceptable but that admitting a fertility problem is not. Equally, promoting immigration as the combined solution for both fertility and ageing is not electorally attractive. But the reality is that fertility and ageing as potential problems are lowest in those European countries which have permitted significant immigration (UK, Germany, France, Sweden ….). 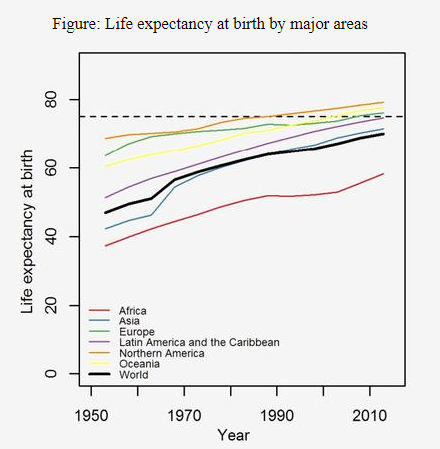 Over the next 20 years an increasing number of countries globally will have to include policies explicitly to address ageing and the decline in fertility. In European countries where the reaction to immigration is strong, there will inevitably be a move towards more restrictive abortion regulations since attempts to be restrictive on contraception would be futile. It will not have escaped the notice of demographers and policy planners that in Europe there are about 25 abortions for every 100 live births. I can envisage the situation where having a child (and especially a second child) is of such value to a society that it is prioritised over being free to work. A steady increase of incentives in the form of child benefits and tax breaks can be expected. In Japan, of course the population implosion problem is real and is already under way. The fertility rate is currently at 1.29 (replenishment 2.1) and not only is population declining but the ageing problem is gathering pace. By 2050 population will drop by about 30 million from 127 million today to about 97 million. At the same time the proportion of the population over 65 will increase from about 25% today to about 40%. The impact on the critical ratio of “working population” to “supported population” is even more severe. And so the Japanese government is introducing further policy measures. Japan’s fertility rate for decades has continued to decline. The sharp fall in 1966 is attributed to a superstition according to which women born in the year of the Fire Horse will bring grief upon their future husbands (Source: NIPSSR 2006; Schoppa 2008). Iran has been aware of their coming fertility problem since the late 1980s but has relied so far on exhortation to try and increase fertility. Last year the Ayatollah Khamenei issued a 14 point plan to improve fertility rate. Iran has seen its fertility rate reduce from close to 7 children per woman in 1960 to around an implosion level of 1.8 per woman at the current time. For a stable population the replenishment rate required is 2.1 children per woman. Through the 1980’s Iran ran a free contraception program and the birth rate plummeted. So much so that Iran is facing a coming crisis of population implosion. The Ayatollah Khamenei has taken notice and issued a 14 point plan to increase the fertility rate. But now legislation is being introduced and two new bills will ban voluntary vasectomies and be much more restrictive on contraception and abortion. Human rights and lobby groups such as Amnesty are opposing the legislation on the grounds that they would “entrench discriminatory practices and expose women to health risks”. I am not so sure that the Iranian legislation is coercive in itself. I think it is attempting to make having a baby the default rather than not having a baby. Both Japan and Iran have very little immigration which can help their numbers though there are signs that Japanese politicians are trying to pave the way for some future immigration. But over the next few decades, an increasing number of countries will have to come to grips with population implosions and ageing. Alarmism has its downsides. It is always cowardly since it requires actions (and inactions) to be subservient to fear. The actions proposed by Alarmists are very often coercive in the name of the “common good”. But the Alarmists are nearly always wrong. For over 40 years we have been brain-washed by the Malthusian alarmism of catastrophic population growth, catastrophic resource consumption (peak oil, peak gas, peak food), catastrophic loss of biodiversity and catastrophic environmental change. The population alarmism was expounded in 1968 in Hardin’s “Tragedy of the Commons”. Garrett Hardin was one of the leading lights of the population doom-sayers. His paper became a classic but is a classic example of the arrogance of the Alarmist, overwhelmed by the fear of doom and looking down at the “Commons” from on high. It was the conclusion of the Hardins of this world that “coercion” was both necessary and acceptable to control breeding which led to the coercive sterilisation programmes and the one-child policy. Freedom To Breed Is Intolerable. To couple the concept of freedom to breed with the belief that everyone born has an equal right to the commons is to lock the world into a tragic course of action. It is painful to have to deny categorically the validity of this right; denying it, one feels as uncomfortable as a resident of Salem, Massachusetts, who denied the reality of witches in the 17th century. ……. If we love the truth we must openly deny the validity of the Universal Declaration of Human Rights, even though it is promoted by the United Nations. ……..
Al Gore like Hardin before him is another example of an arrogant Alarmist. We are now less than one hundred years away from a general population decline across all countries of the world. It is already a reality in many countries. Development and economic growth and the emancipation of women has achieved far more than forced sterilisation programmes. The Chinese one-child policy has only anticipated by a few years what development would have achieved anyway. Japan’s population will be down to less than 90 million in 2060 compared to the 128 million today. The replacement fertility rate is 2.1 births/woman in industrialised countries and about 2.3 -2.4 in countries with higher mortality rates. Already (2014) more than half the world’s population has fertility rates below the replacement level. 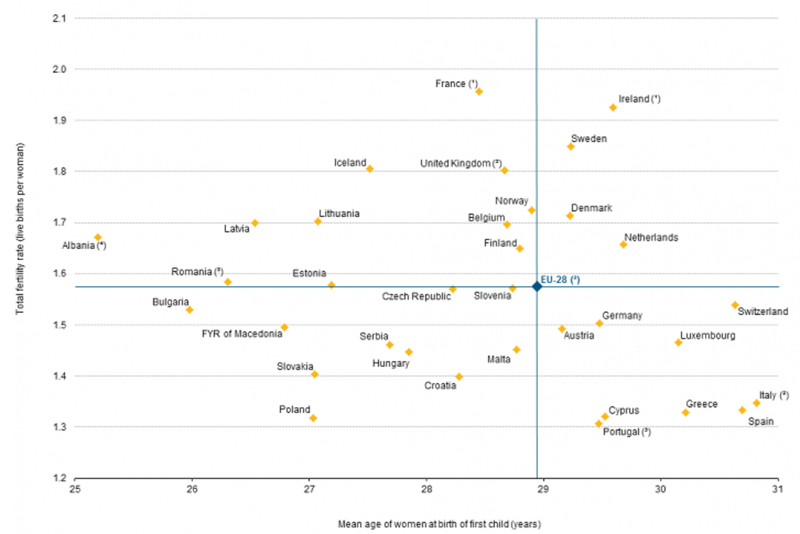 Europe as a whole has a fertility rate of less than 1.6. So has China. Japan is at 1.4 and Singapore is down at 0.8. 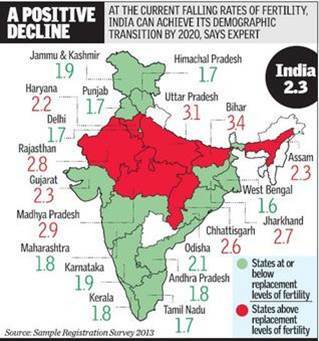 More than half the states of India are at below the replacement rates and half are just above but declining fast. Countries which have significant immigration from developing countries initially see a boost to their fertility rates but that tends to be short-lived as immigrants are assimilated and also exhibit the rates applying to the country’s level of development. In parts of Asia, Africa and Latin America where fertility rates are higher than the replacement rate, they are declining fast. Hardin got it quite wrong. As with all Alarmist memes, he was more than just a little condescending of the “Commons” but his worst mistake was allowing his fear to exclude common sense. The freedom to breed is no guarantee that any breeding – let alone uncontrolled breeding – will occur. In fact, it is the freedom not to breed which could make humanity extinct. Many countries are now seeing population declines in rural areas which are significant enough to affect local tax revenues and cause the deterioration of infrastructure and social services. All over Europe, rural areas see growing needs for health and social services for the elderly and declining demands for children’s services. Skilled craftsmen leave because the client-base is declining. The public sector in rural areas is tending towards being both underfunded due to the loss of tax revenues and over-staffed (and mis-matched) for the declining and ageing population. It is not that planners are not aware of the challenges. Some of the changes of attitude which can also be observed are of couples marrying later (or not marrying), of women having children later and a social acceptance of being childless. It is the spread of the ability and of the freedom not to breed which dominates fertility rate decline. While we can observe the decline of fertility rates all across the world, we have no clear notion of how fertility rates can be increased. Many countries have tried but few – if any – have succeeded in increasing fertility rates. Russia has tried many times and failed. In 1944, as Russians were being ground up in the war against Germany, Josef Stalin created the “Motherhood Medal” for women who bore six children. …….. In 1955, Nikita Khrushchev surveyed the nascent Western overpopulation mania and declared it a “cannibalistic theory” invented by “bourgeois ideology.” ………. None of it worked, then or now. The Soviet Union’s fertility rate—that’s the average number of children a woman bears during her lifetime—declined throughout the ’50s, ’60s, and ’70s. The only brief period of increase came during the late 1980s. And then it resumed decline. Putin’s initiatives haven’t fared any better. The Russian government declared demographic victory in 2012 because there was an increase in the crude number of births. “The demographic programs enacted in the past decade are, thank God, working,” Putin said. But most demographers believe this is a statistical ghost—the slight spike in fertility rates during the late ’80s created a relatively fat cohort of women now in their prime childbearing years. So while the number of births has increased thanks to the size of this cohort, Russia’s total fertility rate has remained very low. The CIA World FactBook puts it at 1.61. Singapore, Spain, Japan and South Korea have all instituted programmes to increase fertility rates but – at best – they have had limited and only temporary success. Iran has shifted from promoting birth control to promoting more children. Ayatollah Khamenei has implemented a 14 point plan to avoid a population implosion but the fertility rate is still stubbornly declining. 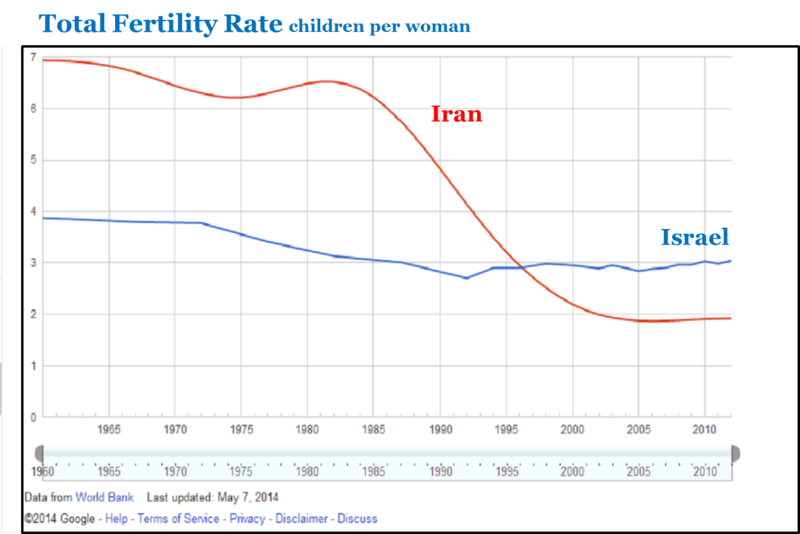 Iran has seen its fertility rate reduce from close to 7 children per woman in 1960 to around an implosion level of 1.8 per woman at the current time. …. 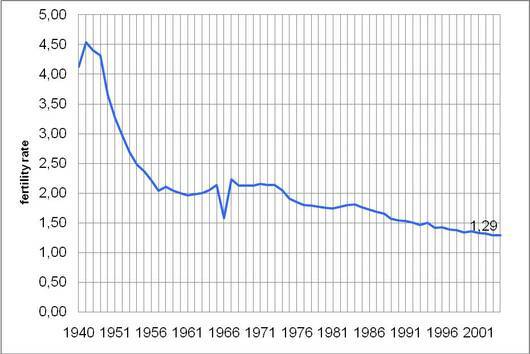 Through the 1980’s Iran ran a free contraception program and the birth rate plummeted. So much so that Iran is facing a coming crisis of population implosion. The Ayatollah Khamenei has taken notice and issued a 14 point plan to increase the fertility rate. The fertility increase programmes around the world generally offer various forms of financial incentives – by way of grants or tax breaks or subsidies – for additional children, but the declining trends have not been arrested. By 2100 the world population will be between 10 and 11 billion and a fertility rate of -perhaps – about 1.9. To remain at such a level is unsustainable of course, but the real question is what are the behavioural forces which could increase fertility rate. Certainly financial incentives will help but their effect seems weak. An Alarmist of the 22nd century would no doubt suggest coercive and compulsory artificial insemination and ban abortions for convenience. But parents resentful of children they are forced to have seems counter-productive. Better no child than an unwanted child. The social engineering needed to ensure that sufficient breeding takes place – but not too much – will be the challenge of the 21st century. Maybe it will happen naturally. No doubt children will be given higher value when they are in short supply. But I suspect that behavioural change, leading to the desire to have more children, will only come when there is both an elevation of status and of the financial condition of the mother. I can imagine a time where the social accolades and real benefits for having children are more than sufficient to outweigh the perceived disadvantages. But a woman’s career is also linked to fertility rate and there is an obvious trade-off between caring for a number of children and a woman’s working career. An increase of fertility may be necessarily connected to a reduction of time spent on the labour market. Abortions for convenience may come to be impacted more by social acceptance and social pressures than by any religious or moral considerations. Having children may afford social prestige. The countries of the former Soviet Union maintain the highest rate of abortions in the world. In 2001, 1.31 million children were born in Russia, while 2.11 million abortions were performed – 62% of all conceptions. Currently about 25% of all conceptions worldwide are aborted. In Japan, the overall abortion rate dropped from 26% to 22% of all conceptions between 1975 and 1995 but these rates are thought to be under-reported. These numbers are not insignificant since a dangerously low fertility rate of 1.6 – for example – would increase to 2.1 without the 25% abortion of all conceptions. It is conceivable that abortions will come to be permitted only for serious health issues for the mother or for the foetus. But the bottom line is that every freedom has a corresponding duty. And so does the freedom to breed. There has to be a perceived duty to breed but not to breed indiscriminately. It is becoming increasingly obvious that population implosions in many countries – not population explosion – is what faces humans by 2100. Reuters: In his 14-point decree, Ayatollah Ali Khamenei said increasing Iran’s 76 million-strong population would “strengthen national identity” and counter “undesirable aspects of Western lifestyles”. “Given the importance of population size in sovereign might and economic progress … firm, quick and efficient steps must be taken to offset the steep fall in birth rate of recent years,” he wrote in the edict published on his website. Khamenei’s order – which must be applied by all three branches of government – in effect replaces the “Fewer Kids, Better Life” motto adopted in the late 1980s when contraception was made widely available. Improved medical facilities during pregnancy and medical treatment for male and female infertility will be made available and health insurance will cover childbirth. It certainly has not escaped notice in Iran that Israel has a steady fertility rate of about 3 children per woman. Whether this will halt the trend is not certain. Iran will not be alone in encouraging higher fertility rates. For some countries the population implosion is already approaching and a matter of great concern. BusinessWeek: Japan is expected to see its population contract by one-fourth to 95.2 million by 2050 … making it the fastest-shrinking country in the world. Former Eastern Bloc nations Ukraine and Georgia came in second and third …. ……. “Europe, Korea, and Japan have gone into panic mode,” says Carl Haub, a senior demographer at the Population Reference Bureau. A declining population impacts a country’s economic growth, labor market, pensions, taxation, health care, and housing, according to the U.N. Globally by 2050, the number of older persons in the world will exceed the number of young for the first time in history, according to the U.N. The imbalance will create havoc in the pension systems and make it difficult to support retired and elderly persons, Haub says.